Living with one or more missing teeth affects your life every day! Things like ordering food at a restaurant, or smiling for the family photo become difficult or embarrassing, and it takes a toll on your confidence. Dr. Anthony Giamberardino has been providing patients in MA with high quality dentistry for over thirty years, and he has solutions for patients who struggle with missing teeth. Here are some of your options for replacing missing teeth. A dental implant is one of the best tooth replacement options that dentistry has to offer. The secret to their success lies in the fact that they restore both your root and your tooth. A biocompatible titanium post is surgically placed into your bone and allowed time to heal and integrate. This creates a stable foundation for your new tooth, which is a high quality porcelain crown. Dental implants in Medford restore function to your teeth, as you’ll be able to talk, smile, eat, and chew as you were used to. They’re also easy to care for because you’ll also be able to brush and floss normally. They offer great longevity, as with excellent home care and regular dental checkups, they can potentially last a lifetime. For patients missing one or more adjacent teeth, a dental bridge may be ideal for restoring their smile. Using dental crowns as anchors to your healthy teeth, a bridge uses prosthetic teeth to fill in the gap. Dr. Giamberardino customizes your bridge to match your existing teeth so it’s aesthetically appealing. Keeping your anchor teeth clean and healthy is important to ensure the longevity of your bridge. 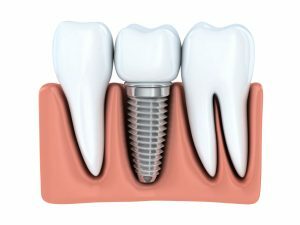 Dental implants can also be used to anchor and support a bridge. A full denture is a removable appliance that is designed to replace an entire arch of teeth. Typically made of acrylic, a denture uses suction and a secure fit to stay in place. Dr. Giamberardino custom designs it with your facial features in mind so it immediately restores your smile. Dentures in Medford do have a learning curve as patients get used to talking and eating with them. Dental implants can be strategically placed to support a denture. The denture is designed to snap into the implants, which provide a secure and stable fit with no movement or slippage when you talk or eat. If you’re living with one or more missing or failing teeth, we encourage you to schedule a consultation with Dr. Giamberardino to discuss the possibilities for restoring your smile.